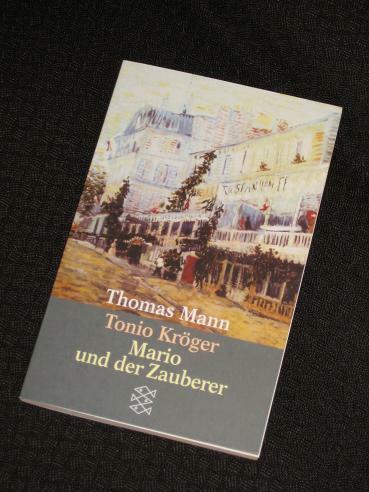 I read Tonio Kröger on my Kindle a good while back now, but when I saw a cheap edition featuring this story and another of Thomas Mann’s novellas, Mario und der Zauberer, I couldn’t resist. At the start of Tonio Kröger, our eponymous hero is a young boy growing up in a north-German town, the product of a marriage between a local businessman and a southern-European beauty. Different from the locals in many ways (not least of which is his bi-cultural name), he falls in love with two examples of the Aryan folk around him: the popular Hans Hansen and the beautiful Inge Holm, neither of whom really feel the same way about him. …which is not to say that my little electronic friend is not useful in its own right. After all, my first reading of Tonio Kröger was in digital form, and were it not for free e-copies of classics, it’s doubtful that I would have got into the author of the next of today’s stories. Shortly afterwards, the story ends, and we return to our old man sitting alone in his study, the darkness engulfing him as the black waters of the Immensee once did. (sniff) Immensee was quite the devastating story. I've read Tonio Kröger in a collection of Mann's stories but forgot what it's all about! I've only ever read some of Mann's novellas and short stories (most of his long novels are still on my wish list). My favorite story of his is “Disorder and Early Sorrow”. the Theodore Storm book sounds like something to read with a good snifter of something heartening, just to temper one before the heartache hits. I got that very same Tonio Kröger but haven't read it yet. I'm sure it is very good. Immensee is a wonderful novella. I really liked it a great deal. I had something very similar but it came from too much hand writing. Typing doesn't affect me that much. It's too bad, I prefer hand writing. Rise – Yes, definitely a three-hanky novella, that one 😉 I haven't read that Mann story, but I'm sure I will at some point – just a matter of working out which collections to buy. Gary – Storm is a great writer, one who concentrated on short stories and novellas. Luckily, I can access most of them for my Kindle (not sure there are any translations available that way though…). A Carpal Tunnel sort of thing? Yes, I think RSI is a slightly outdated term now (showing my age a bit!). Since I wasn't a fan of Death in Venice, I'm not going to rush on the first one. I've never heard of the second writer and it appeals to me, so thanks. I'll try to find a French translation. Gosh, you were serious about RSI the other day? I thought it was a humourus way to call laziness…Sorry. No worries 🙂 It's not too bad, but it can limit my blogging actvities at times.